In today’s interview, author, biohacker and high-performance coach, Siim Land, shares his thoughts on the ketogenic diet and the various benefits of intermittent fasting. Siim is very passionate about self-improvement, biohacking and helping people find self-empowerment by optimizing their physical and mental performance. Today, we also get a chance to talk about fasting and its benefits. Intermittent fasting has been shown to improve cognition, decrease inflammation and have numerous general health benefits, e.g., lowers insulin. Siim has experimented with various fasting methods and shares some great tips for beginners on how to try intermittent fasting and time-restricted eating, before slowly graduating to multi-day fasting, if desired. If you know someone who is interested in learning more about how to use a keto diet and intermittent fasting for autophagy and its benefits for general health, longevity, inflammation and cognition, this interview is for them.. I enjoyed this interview with Siim as he shares his experience with fasting. 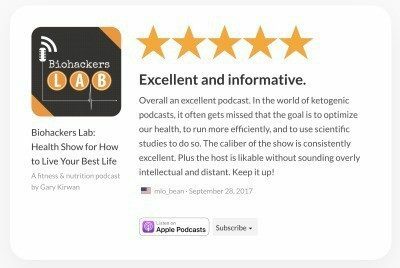 I loved his measured approach to things as he explains why it makes sense to tailor both the keto diet and the fasting to the individual’s personal needs and circumstances. I also enjoyed learning more about the role of autophagy in intermittent fasting and its many benefits to longevity and health. Special thanks to Siim for joining me on the show. Enjoy the episode! To find out more visit Siim’s website or his YouTube channel, where you can also find his podcast Mind Body Empowerment. [00:19] – Introducing, Siim Land, author, content creator, holistic health practitioner and a high-performance coach. He has a degree in anthropology, but is passionate about biohacking and self-improvement sharing his thoughts on how to achieve “Body mind empowerment” through his podcast and popular YouTube channel. [01:16] – We focus today on the ketogenic diet and why he chose it for himself. Siim believes while this diet can be useful (e.g. losing body fat or improving cognition) it is not necessarily always the ideal solution for ALL situations. Genetic predisposition, metabolic requirements and medical conditions are all important considerations. [03:30] – Siim explains why skipping meals and intermittent fasting is actually normal and we shouldn’t be so afraid of it. It has longevity and other general health benefits such as reduced inflammation, lower blood sugar and insulin. [05:03] – There are a number of different ways someone might ‘do keto’. For someone who just wants to maintain their health Siim believes there is not necessarily the one best way of doing keto; it would depend on the individual, taking into account their metabolic/medical conditions, body compositions etc. [06:59] – What is a good way for a beginner to try to start fasting? To start with, Siim recommends skipping a meal in the morning/or evening, by having a late breakfast/earlier dinner. Gradually increasing time spent in a fasted state and eating their meals within a time-restricted window. He also talks about balancing the multi-day fasts. [11:01] – Research on time-restricted eating suggests it is most optimal to postpone breakfast consuming the majority of food in an 8-hour period stopping 2-4 hours before bed. [14:21] – Siim believes that because the calories in tea or coffee are so minute, they won’t significantly interfere with the fasting processes. The very fatty keto coffees, however, will affect the autophagy but not the ketosis. [17:04] – Siim explains that the effectiveness of autophagy benefits will depend on the overall metabolic status of the individual. [18:41] – Currently we don’t have any way of measuring autophagy in humans; all the tests are based on animal studies. Siim explains how we can make predictions based on the research we have. While not perfect, the markers that may hint at autophagy include insulin/glucagon ratio and ketone/glucose index. [21:11] – We define autophagy and how it ties into the mind body empowerment. Siim explains autophagy is a critical factor for longevity helping to remove dysfunctional mitochondria. It can also prevent cognitive decline. [23:03] – Tips for doing a 3-day fast for the first time. The most difficult thing can be falling asleep; herbal teas/decaff coffee or apple cider vinegar with hot water may help with this as well as during the fast. Drinking water with electrolytes, also helps during the fast. Siim also explains, why it is important to start eating low-carb a few days before starting the fast. [29:09] – Working out during the fast period? It is a good idea to stay active – longer walks or yoga help keep the mind busy and prevent hunger. In addition, some resistance training can help prevent muscle loss. [31:10] – Siim explains 3 to 5-day (max) fasts are a good point to aim for. Three day fast is usually the optimal dose, unless there are some real medical conditions to consider. [32:22] – Tips on breaking the fast; start with apple cider vinegar, hot lemon water and some raw ginger to promote digestive enzymes. Then, depending on the length of the fast, Siim recommends consuming probiotics/fermented foods, bananas, kiwis etc. For a longer fast he also adds liquids such as soups easing into it before consuming harder to digest foods. [34:42] – Siim describes his mental and physical experiences during periods of extended fasting including heightened mental clarity, focus as well as a blissful, relaxed feeling of not being attached to anything, food or otherwise. [36:48] – We talk about the more extreme fasting technique, dry fasting; Siim explains why it makes some metabolic sense. [41:03] – For those people who are interested in learning more and following Siim, visit his YouTube channel where you can also find his podcast Body Mind Empowerment (also available on iTunes). He also has books on keto topics such as keto fasting and keto body-building. His upcoming book Metabolic Autophagy will go into more details about stimulating autophagy with fasting and how to balance it out with other aspects such as re-feeds, exercise and promoting longevity.